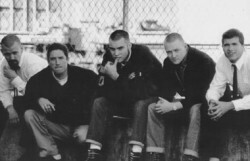 The Skoidats formed in the summer of 1995 in Helena, Montana. Soon after their inception, they relocated to Missoula, Montana, losing two members in the move. After arriving in Missoula, the three original Skoidats placed an ad in the paper to find a new horn section. It was soon answered by two members of the University of Montana marching band. They were the first and only horn players to be auditioned. The Skoidats are sadly no longer making new music. The band ended in 2001, but they made quite a bit of great music before disbanding. The Skoidats weren’t just a Ska band, they were a mix of Ska, Punk, Jazz, and even some Rock. I really liked the vocals, as they were deep, scratchy, and kind of rumbly. I don’t actually have much to say about them, just that you should listen to their music because it’s really good. It’s not about what I say anyway, it’s about the music, so check out The Skoidats!